Here’s the thing: I think I have a kidney stone. I also think it’s making its way out of my body so I’m not in as much pain as I could be and the worst of it was definitely back on Tuesday/Wednesday. It’s Sunday now and I’ve lost oodles of writing time to this, even though I’ve actually written more than usual! Well, I’m in a particularly good place mentally for the writing I think and would have probably written a lot more if I hadn’t been hurting. That’s what I think. I could be totally wrong. I do seem to perk up when I’m in pain. Weird, I know. So maybe the pain itself is causing me to be more focused (in pain, not sick—there is a definite difference—if I were sick, there would be no focus!). Anyway, long story short, I really need to finish this book, so today I am going to try to stay focused on writing and write as much of this book as I can. My record word count for a day is 6,241 words. I don’t know that I can beat it, but I think it’s the right day to try. I’m going to post my progress as the day goes on to try to keep myself focused on the writing and moving the book forward. My biggest concern is that I’ll fall into a cycle of perfectionism, become too critical of what I’ve written / am writing and end up rewriting or redrafting stuff. That kind of thing will make it impossible for me to write more than a couple hundred words an hour, and that’s a fact. That kind of pace will not let me make the kind of progress I want to make today, so I’m saying it now: NO SECOND GUESSING MYSELF TODAY. It’s time to let the words flow! Things are going well enough. I had a longer break than I should have taken when I stopped for lunch so I’m just now getting back to the writing, but I did start at noon and have a lot of day left so it’s not the end of the dream by any means. The story is still going well. I’m going to have to be careful of my critical side because if I start wanting to turn back and go a different direction I’ll lose a lot of momentum (and words!). I need a break for supper soon so I’m going to get a few more words then stop for a little while. I can’t say I’ll be back. I’d definitely like to continue but I don’t think I’m going reach my challenge word count. Miracles happen, sure, but I’m still suffering here with frequent bathroom visits (kidney stone, remember?) and some unpleasant back pain, and I’m really starting to itch for a long break. 6th (and final) check-in: 1,883 words. It’s the next day that I’m writing this final check-in note, because I was right to suspect I wouldn’t make it back. I ended up going to bed early (for me) and sleeping off and on for 10 hours. I felt worse last night but better today so I’m going to try this little challenge again. I’m starting early this morning (relatively speaking, after staying up until 2 am). I’ve had breakfast and I’ve gone back into my hosts file and blocked some particularly distracting sites because I’m actually excited to get started again and I do not want to squander that feeling by scrolling through news and forums posts for a hour or more. In actuality, I’ll start by reading what I added last night—stuff to tie in the ending better, really, and just some redrafting of a few paragraphs and sections, because just changing the wording around isn’t the goal here. I mean, I could, but it’s a waste of time and wouldn’t help the issues, and could make things a lot worse. My problems with these chapters aren’t just issues about how I wrote sentences. That stuff is irrelevant at this point. This is something else, something deeper. Right here, in these places, the story just doesn’t feel right to me. Since I’m my own reader, if it doesn’t feel right to me, it ain’t right. Period. If I let myself fall into the rabbit hole of making this about the sentences, I’d probably ruin the book. I’ve learned my lesson on that. That is still my best selling book and the opening is absolutely fine. I was being hypercritical of myself and the way I sound on the page and I almost messed up the beginning of that book, all because I didn’t trust myself. That was my breakout book. It’s why I’m able to write full time. This situation is different. I am trusting myself here. The problems with these chapters I’m working my way through aren’t the fevered imaginings of a hypercritical reader. I’ve gotten pretty good at shoving that aside when I’m reading during my edits—sure, I may cringe occasionally over a real clunker, but I tend to recognize that for what it is. Maybe not all the time, but right now, for this, definitely. There are problems here that need fixed. So that’s what I’m going to do, get in there and fix them. Here’s where it stands right now. I went back to a different book to compare these numbers and for that one my reading speed was very close to 10,000 words per hour. That just goes to show how slow this one is going. And just for comparison, chapter 4 is not a short chapter. It was just a good one and I was finally getting into a groove with the reading. Then chapter 5 hit. I took the computer up, but instead of writing I just sat with it on my lap and stared at it until I almost dozed sitting up. At that point, I snapped the lid closed and went to sleep. Just too tired. Being off my sleep schedule and not getting enough sleep have apparently taken their toll. I need to be writing as early in the day as I can right now while I have enough energy to do it so that’s what I’m about to do. I’m going to finally get through chapters 15 and 16 this morning (it’s 9:32 am) and I’m going to do it within in the next hour. By 10:30, I want to be ready to start in on the next chapter. Is it perfectionism stalling me out? Yes, yes, it is. I’m still working through chapter 15 as of yesterday. It should have been simple to get through chapters 15 and 16 and on to new stuff, but that didn’t happen. I was fixing a few lines that didn’t feel right for one character now that I’ve eliminated some of the excessive mental wrangling I had him doing because I couldn’t figure out where I was going with him, and I started writing some new stuff for him right there in the middle of the chapter. It was good stuff too so I went with it, but I did agonize over it a little too much because it had to fit in between other stuff, which is always a chore for me. I’d like to stop going back in my books like this, because as you can see from the multiple days of slow writing but long hours, it isn’t that fun for me! Today, I’m going to finish these two chapters even if I have to take a hands off approach and jump to the next damn chapter. That’s not the plan but if I find myself getting hung up on stuff just because it could sound better in my head if I wrote it another way, I’m doing it. That’s perfectionism trying to hold me back, and I can’t let it win. 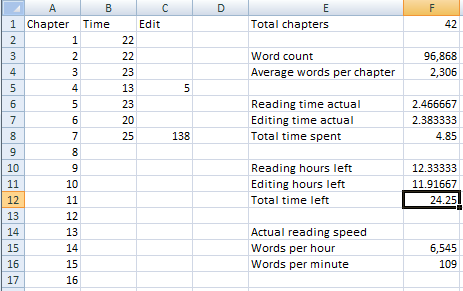 Yesterday’s totals came to 3.65 hours of timed writing and 379 words after new stuff, deletions, and redrafts. I was very inefficient yesterday, because if I were at a job where time at my desk counted, I would have logged a solid 9+ hours. I was tired when I finished (who wouldn’t be after spending 9 hours at their desk?) but I did start making progress toward going to sleep earlier. Not much, since it was still just about 1 am when I called it a night, but 1 am is better than 2 or 3 am!